Can you drink a soda with a water hose? You can, but wouldn't a straw work better? Same with Collector car Insurance, it’s insured, but what if you have a claim? We spend $10,000’s or even $100,000 on Collectible vehicles and then insure them through the same company that insures our daily driver. You trust that your agent has provided you with the best coverage available and he did. He sold you the policy he had available to him. What he didn't tell you was that his company doesn't sell the type of insurance you need! Unless you have an extraordinary custom written policy that covers the “replacement value” of your vehicle, they have sold you the typical stated values policy that entitles you to the fair market value of your vehicle. Lets take a look at a fairly common scenario. 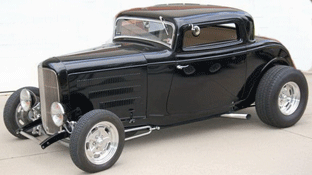 1932 Ford 3-Window Coupe with a Chevy 350 small block and a TH350 Transmission, plenty of chrome, a deep rich paint job, something you can be proud of. It cost anywhere from $100k - $150+k to build, several years back and forth from one shop to another, split the difference and say it cost $125k to build that car. An unfortunate event occurs; hypothetically your neighbor’s house catches on fire and burns your garage down and your house is saved. No problem between you and your neighbor you must have 2-3 policies that cover the structure and its contents. If you had the can insured with an Agreed Value policy for the replacement cost YOU SPECIFIED you get paid $125,000. Well you think to get that kind of coverage must be expensive… It’s not! Agreed Value policies have limited used, the car has to be garaged and no more than 7,000 miles per year. These limits ensure that claims are kept to a minimum therefore the premiums are very affordable. Most Hot Rods and collectible cars are only driven to an occasional car show or club meet and after spending $125k on it you not going to leave it in front of your house overnight. An agreed value policy suits your needs, and is more affordable. The crappy daily driver insurance costs more and isn't going to replace your car, seems like a no brainer to me. Specialty Insurance Companies, including AAA sell Agreed Value Insurance, the big companies that sell Daily driver insurance typically only sell Stated Value Insurance, but will try and sell you what they have in the name of multiple vehicle discounts. Do the math, look at the coverage; if you have a claim, you’re going to get mad. If you’re Specialty, Custom or Classic car insurance policy has an Appraisal Clause in it, it’s not an Agreed Value Policy. Insurance coverage can be confusing, if you’re not sure about your coverage give us a call and we’ll help you decipher your coverage and you can decide if you’re comfortable with you coverage, we don’t sell insurance, but we help people that bought the wrong insurance get a better settlement, but not what they have into the vehicle. Friends don’t let friends drive Hot Rods with crappy insurance! !